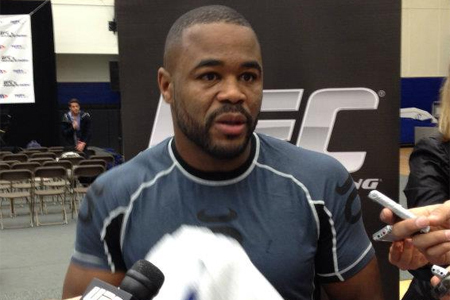 Rashad Evans (pictured) was slated to fight Daniel Cormier this Saturday at UFC 170. Instead, the former light heavyweight champion will undergo knee surgery later this week and will be sidelined for roughly six months after the operation. Dr. Kvitne in Los Angeles, California will perform the procedure. Evans was last seen in November posting a TKO victory over Chael Sonnen at UFC 167 to collect his second straight W. “Suga” has won six of his last eight scraps and was hoping a victory over Cormier would propel him to the front of the light heavyweight top contender line. Based on the timeline laid out by his Blackzilian team, Evans will be two months shy of 35 when he returns from surgery. Cormier now meets last-second substitute Patrick Cummins this weekend at UFC 170.